An unprecedented demand from fans for tickets to The 148th Open at Royal Portrush has led to the fastest-selling opening day of ticket sales in the history of the Championship. Over 20% of the entire ticket allocation for The 148th Open was snapped up within 48 hours of going on sale by fans eager to secure their place for the historic occasion. The Open will move to an all-ticket model for the first time in 2019 and it is expected to be the first ever Championship to sell out. Hospitality experiences have been in equally high demand with The Links Club Hospitality having already sold out for Saturday and Sunday and only limited availability remaining for weekly packages. An estimated 190,000 spectators are expected to attend The 148th Open and fans are advised to secure their tickets well in advance to avoid disappointment. Priority tickets are available now exclusively to members of The One Club for a limited time. Registration for The One Club is free and guarantees first access to tickets as well as a range of other benefits. Johnnie Cole-Hamilton, Executive Director – Championships at The R&A, said, “Monday’s record-breaking ticket sales underlines the level of excitement there is among fans at the prospect of The Open returning to the island of Ireland for the first time in almost 70 years. 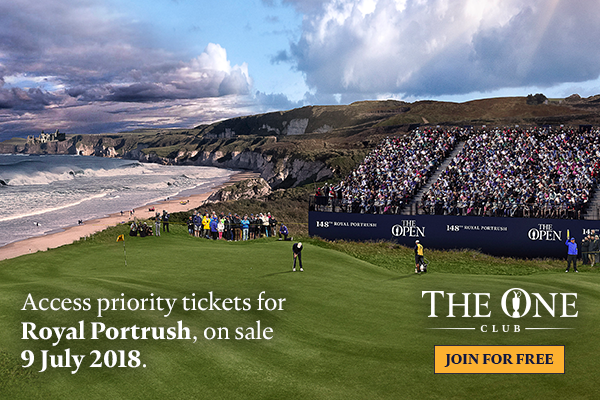 Tickets for The 148th Open at Royal Portrush can be purchased HERE. All new members of The One Club will receive immediate access to priority tickets. Children under the age of 16 will be able to attend the Championship for free alongside an adult guardian under The Open’s “Kids Go Free” programme. Those aged under 25 can purchase tickets at reduced prices and benefit from free camping.